Seagate’s formidable new BarraCuda Pro hard drive combines mountains of space with plenty of speed. It’s tempting to think that hard drives have become a commoditised item, where only speed and capacity matter, but this is not so. One of the most important considerations when choosing a hard drive is the workload it faces – because different drives are optimised for different uses. Seagate’s new BarraCuda Pro packs a massive 14 terabyte capacity into its 3.5-inch exterior, outstripping any SSD on the market and making it a fantastic choice for anyone that needs lots of space. In fact, it’s the largest capacity drive on the market, and its high data density and head count combine to make it one of the fastest mechanical drives on the market too. But there’s much more to it than that. The BarraCuda Pro offers better reliability, energy efficiency, burst speed and longevity than any of its rivals. While these facets mean it’s suitable for almost anyone with large storage requirements, it’s designers and creative professionals that should seriously take notice – as this drive is tweaked for creative applications. Let’s go through its key features and discover why. 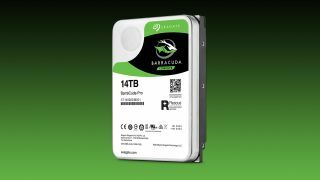 To the uninitiated, there might not be much excitement if you simply regard the 14TB BarraCuda Pro as a traditional 7,200rpm mechanical hard drive. Things change dramatically, however, when you learn that the Barracuda Pro drives make better use of their SATA III connection – and its 6Gbps throughput – than almost any other mechanical drive. That’s because the Barracuda Pro has a whooping 256MB cache, which means frequently-used data can be moved around at the fastest burst speeds. When it comes to sequential writing, we tested the 14TB BarraCuda Pro using CrystalDiskMark benchmark and found that it could boast incredible 250MB/s sustained transfer speeds. This is significantly-higher than the previous-generation 8TB BarraCuda Pro, which managed an (impressive at the time) 200MB/sec sustained transfer speed. In the PCMark 7 System Storage Test, the 14TB BarraCuda Pro scored 3,000 which is likewise a significant way ahead of the 8TB’s sub-2,800 score. The upshot is that if you’re regularly working with large multimedia files on a local or directly-attached hard drive, the BarraCuda Pro will save you time and reduce any annoying lag stemming from delays in read/write performance. In addition to this, Native Command Queuing (NCQ) technology is present, which dynamically scans the data requests being made of the drive, analyses them to establish the most efficient order of retrieval/writing before executing the commands in the quickest possible way. In short, this reduces I/O operational latencies and makes usage much more responsive before any reading or writing even takes place. NCQ works in conjunction with another of Seagate’s speed-enhancing technologies called ‘Multi-Tiered Cache (MTC)’. This uses a variety of different solid-state memory types to offer speed, reliability and even value enhancements in order to provide the best combination of caching technologies. It’s a little too complex to detail in full here, but if your someone with a more-inquisitive bent, you can read more about it here. A side benefit of fast and intelligent caching is that this can also reduce mechanical wear, which in turn helps improve drive longevity. Which neatly brings us to our next point. Seagate recognises that data is often far more important than the physical objects that house and surround it. Many physical items can be replaced when damaged, but information is sacrosanct. The good news is that BarraCuda Pro hard drives have many integrated technologies to not only stave off an inevitable death by the longest possible measure, but make restoration of data feasible if the worst-case scenario occurs and a drive stops working. Indeed, Seagate is confident enough to provide a 5-year warranty for all Barracuda Pro hard drives and this includes 2-years of Seagate’s Rescue Data Recovery Plans, which cover against mechanical failure, accidental damage and even natural disasters! As anyone who’s experienced data loss knows, retrieving it can represent an expensive dark art. Seagate’s service has a 90% success rate and the company promises to get your recovered data back to you within 15 days. Not that this is likely to occur. Technologies such as a ‘dual-plane’ balance system help keep vibrations to a minimum, while the drive has been designed and tested to work with an astronomical 300 terabyte workload each year. If none of that provides peace of mind, then Seagate’s 40-year industry heritage should help! Whether you regard power consumption as a primary concern of power bills or the environment, the 14TB Barracuda Pro once again has you covered. By drawing only 6.9 watts, it’s one of the lowest power-consuming 3.5-inch units on the market. Ultimately, the 14TB Barracuda Pro is one of the most all-round attractive drives on the market, and it’ll suit anyone with demanding computing needs. However, the particularly-fast random access performance, sustained transfer speeds, reliability and high capacity mean that creative professionals should especially take a look, whether it’s for an internal drive or an externally-attached unit. If your use case is different, such as a NAS or surveillance system, Seagate has better-optimised alternatives for you – as those tasks that don’t require such high-performance boosts! If what you want is a large primary drive, robust working drive or a closely-attached drive that offers fast-access, however, then the 14TB Barracuda Pro offers an unbeatable combination of high capacity and solid speeds.